Peru has been dealing with civil unrest practically since the time the Spainards arrived in the new world, and most of today's issues have roots in long existing problems dealing with land, culture, and respect for human rights. The recent attack on the Japanese ambassador's house in Peru by Tupac Amaru rebels was more than simply a display of terrorism and a demand for releasing Tupac Amaru prisoners. It was a demonstration of the frustration and resentment that many people from the lower classes, rural areas, and indigenous populations feel towards the government of Peru. Although few condone the use of violence, it appears that a majority feel this has become the only avenue for seeking a voice in their country. Violence and repression has been used by both sides, rebels and the government. This case study will recap the recent hostage crisis, and will discuss how and why groups such as Tupac Amaru have become popularized. On Dec. 17, a week before Christmas, guests were arriving at the annual birthday celebration for Emperor Akihito at the Japanese ambassador's house in Peru. This celebration is a prestigious event every year for Japanese embassies around the world. The guest list included Lima's most important political and social figures, including the foreign and agricultural ministers, the president of the Supreme Court, six Supreme Court justices, five generals of the National Police and Fujimori's mother, sister and brother. Also present was U.S. Ambassador Dennis Jett, who left the party early, and seven U.S. diplomats, that lingered a little longer. The only person missing and perhaps the most important one was President Fujimori. The guests were enjoying the pleasant summer evening sipping champagne and cocktails and eating sushi. But all the festivities came to a dramatic halt at about 8:00 pm. Without warning, an explosion shook the entire house. In less than a minute, 14 masked men and women, some of them teenagers, clambered through the hole they had opened in the garden wall, and slipped behind the trees. Two of the intruders took positions at the front entrance. And then, finally, an announcement was made that left everyone astonished and in fear. "This is the Tupac Amaru Revolutionary Movement. Obey and nothing will happen to you. [Schemo, 1997]"
minutes the guests lay on the ground with gunfire flying over them. 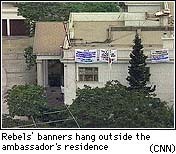 Suddenly, the second in command, whom the rebels called El Arabe, asked for the party's host, Ambassador Morihisa Aoki. He then ordered him to take a megaphone, and instruct the police to hold their fire. As soon as the firing stopped, the rebels announced that they would release all the waiters, women and elderly guests. However, when they opened the door to let them out, the police lobbed tear gas into the house. The rebels had come prepared with gas masks, and were hardly effected by the gas. The guests grabbed handkerchiefs or paper napkins for protection. Aoki took the megaphone and repeated his request for the police to hold their fire. He then turned to El Arabe. "Let these people go,'' he told him. "They've got nothing to do with this. I, alone, am important enough for you to bargain with. [Schemo, 1997]'' Only then did the police hold up and guests begin to file out. As the elderly and women began to evacuate, Sally Bowen, a journalist, told a guerrilla standing near her that she wanted to stay. Her request was denied, but before she was released she was taken to meet the commander of the operation, Nestor Cerpa Cartolini. She and another journalist asked Cerpa what the rebels were doing there. Cerpa reached into his knapsack and pulled out a book, "Companeros, Toman Nuestro Sangre,'' or "Comrades, They Take Our Blood.'' He then explained, "This is where it all began.'' The book focused on union workers whom Cerpa had led in the takeover of a bankrupt textile factory called Cromotex in 1979. That clash had ended, without much attention, in a military assault that killed six workers [Schemo, 1997]. The Movimiento Revolucionario Tupac Amaru (The Tupac Amaru Revolutionary Movement, MRTA) was founded in Lima and took up arms in 1984. Today there are an estimated 300 to600 members, and they operate mainly in the upper and central Huallaga Valley. This area is in eastern Peru, and has been controlled by both MRTA and Sendero Lumninoso (Shining Path) rebels for the past 20 years as well as narcos (drug traffickers) and anti-drug authorities. The MRTA named themselves after an 18th-century leader who fought Spanish colonial rule, that leader had taken the name Tupac Amaru from the last ruler of the Incan empire. To an extent, their name alone reveals plenty about their background and philosophy. The MRTA has attempted to "liberate" the mostly indigenous populations from oppressive government rule, and follow in the steps of the Cuban Revolution, mainly inspired by the words of Che Guevarra. Although the groups is most known for its violent attacks, such as the raid on the ambassador's house, it is known to local populations as a "Robin Hood" type organization, stealing from the rich to give to the poor. On several occasions the group has demanded food and clothing in exchange for hostages, later distributing the food and clothing in Peru's shantytowns. The majority of MRTA members are from rural areas and peasant farming villages in the jungle, most from indigenous predecessors. However, in recent years the MRTA has attracted college students who have become frustrated with the socio-economic conditions of the country and have studied leftist teachings. The group had been led by Victor Polay, who happened to be a college roommate of former President Alan Garcia in the early 1970s. Polay was captured in 1992 and is serving a life prison term, as is his lieutenant, Peter Cardenas. Until the siege on the ambassador's house in December, the MRTA had no major attacks. Instead they had several car bombs, minor kidnappings, and threats on businesses. Although public opinion surveys show that most Peruvians do not sympathize with rebel movements and are vehemently opposed to terrorist violence, experts who have studied the country's insurgencies say that Peru will not overcome rebel activity and related violence until it alleviates the social and economic problems that draw people into these groups [Sims, 1997]. (For more see "Arrest of rebel's kin" at Latinolink.) "The guerrillas' message is still appealing in Peru not only because there is rampant poverty but also because there are so many people, especially young people, whose dreams are deferred,'' says Cynthia McClintock, a professor of political science who specializes in Latin America at George Washington University [Sims, 1997]. Close to half of Peru's 24 million people live in poverty, 85 percent of workers do not have full-time jobs, and nearly 17 percent live in extreme poverty, meaning they are not adequately nourished [Sims, 1997]. Although most of these conditions pre-date President Alberto Fujimori, the percentage of Peruvians living in poverty increased last year to 49 percent, from 46.5 percent in 1994, according to Caunto S.A., an economic forecasting firm [Sims, 1997]. 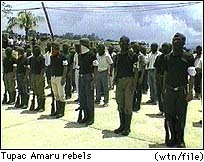 Responses from villagers to the recent events have shown some sympathy for the rebels, particulary the younger members. For example, one shopkeeper from the MRTA home base had this to say about the whole ordeal. "I don't see why they had to kill them all. Any person, knowing that they're about to die, would repent, and as long as they're alive, they can change.'' The shopkeeper agreed that Fujimori had the right to order the raid on the compound, saying, "There were innocent people in there, and they had families that were suffering each day they were held.'' (More on hostages. )The same person also stated that something had to be done about the continued use of violence by rebel groups [Schemo, 1997]. "I'm poor, but I have thoughts and feelings, too,'' the shopkeeper repeated several times. Others make a clear distinction between the MRTA and The Shining Path. When one woman was asked about her feelings toward the MRTA and its leader, Cerpa, she said that they were not in the same class as the Shining Path. "He was not a terrorist,'' she said. "He was a revolutionary.'' Another woman added, speaking low so as not to be overheard, "He fought for us, for the poor. Look at how we live. Look at how we die [Schemo, 1997]." People were most shocked by reports that stated the band of youths in the siege seemed naive, and that one had asked a hostage whether it was possible to walk back to Peru from Cuba, where they had been offered asylum. The MRTA captors warned that they would start killing captives if Fujimori did not appear for face-to-face talks. The MRTA demand and goal was the release of more than 450 MRTA members being held in Peruvian prisons. But the deadline for the executions came and went and Cerpa backed down. Instead, he announced that there would be no killing, at least not by the Tupac Amaru. Hostages say, Cerpa tried to win them over, engaging them in philosophical conversations about the free market economy and the poor whose lot, he strongly felt, would never improve. He inquired about The MRTA's public standing, and whether Peruvians distinguished between the Tupac Amaru and the more violent Shining Path. At one point Cerpa suggested that the Tupac Amaru could transform itself into a political party. During the two weeks after the invasion, the rebels released most of the prisoners, including 225 in a "good-will gesture" shortly before Christmas. At the end of four months there were 71 hostages left in the compound. Fujimori and the rebels took part in negotiation talks but those talks only seemed to go in circles. Meanwhile, Fujimori almost immediately began taking steps for a counterattack to rout out the guerrillas. Before Christmas, a team of 140 commandos began training, working out maneuvers on a mockup of the Japanese ambassador's residence. Ultimately, it was those very same forces that released the hostages in less than an hour without critically hurting any of the hostages. All the rebels were killed and later buried in unmarked graves. The government only disclosed the identity of two of the rebels and refused to permit any funeral services. The closing moments of this episode in Peru's long-standing civil war has brought relief to many and worry to others who fear retaliation is inevitable. involved financing from narco-traffickers on the side of the Shining Path. The growing of coca and the presence of drug-traffickers have always been a source of contention and rivalry between the rebel groups. It is estimated that more than 35,000 people, mostly civilians, have been killed as a result of the conflicts between the government and the rebel groups. Although the civil conflict centers around leftist rebels and the government, its roots go much deeper. Like most of Latin America, the primary arguments have been over land, including land rights, monocropping, and the growing of coca, and the racial tensions that have persisted since the 18th century. Historically, Lima has always been the seat of government, trade, and industry and has controlled the highland regions where most of the indigenous populations and the argiculture takes place. But as can be seen by the figures below the majority of the population is ruled by the minority. Most of the non-indigenous population continue to view the indian populations culturally and racially inferior, and this has led to the continual siezing of community lands. Much of these community lands have been cultivated by the indigenous peoples of Peru for centuries, and a majority of these lands are also of great cultural and religious value to the peoples who inhabit them. Although former presidents, such as General Alvarado, have tried to institute land reforms and grant peasants better land rights, more just agrarian reforms and land rights have been detained by military coups and intervention from land owners and large agricultural companies. Language: For many Spanish is a second language. Poverty: Lack of education, health care, and other essential services makes it harder for these communities to stand up in their own defense. Lack of community organization that would enable strategies for the consolidation and defense of territories. Gradual displacement of the traditional crops for commercial crops (i.e.,coffee, cocoa) thus increasing the dependence on other sources of food and money for basic necessities. Poole, Deborah and Gerardo Renique. Peru: Time of Fear, Latin American Bureau, 1992. Schemo, Diana Jean. New York Times News Service 28 April 1997. Simpson, John. In the Forests of the Night, New York: Random House, 1993. Sims, Calvin. New York Times News Service 23 April 1997. Sims, Calvin. New York Times News Service 5 April 1997. Tulchin, Joseph and Gary Bland. Peru in Crisis: Dictatorship or Democracy?, London: Lynne Rienner Publishers, 1994.